The team at Te kura Whenua in Waikaremoana are now offering a Water Taxi Service. In September 2018 Te Urewera, Waikaremoana experienced some extreme weather patterns. Heavy rainfall caused Rivers to swell to capacity, flash flooding, road closure due to many slips and blowouts and trees were left piled underneath rock and rubble. This weather event caused Waikaremoana to be cut off from Wairoa and Ruatāhuna for a week. Fortunately, there were no casualties and everyone remained in good spirits during this time. The Waikaremoana Great Walk also took a lashing, with these manmade objects no match for natures force. After a review of the GW, serious safety issues were found between Waiopāoa and Waiharuru. After an assessment of the track, and based on the high risks to Human safety the tracked was closed until repairs could be completed. A lot of time and effort went into the planning of the repair work and the approach to this was guided by the principles from Te Kawa o Te Urewera as well as the concept of our Living buildings. The delay caused frustration for those who had booked to do the GW as repairs took longer than anticipated, we offer our sincere gratitude for the patience and understanding shown while Tūhoe and DOC worked through their difference of approach. We can now report that repairs have been completed on the closed area of the track. Karakia has been completed by hau kaina and the partially closed part of the track is now fully open. The team at Te Kura Whenua, Waikaremoana are offering a limited and temporary water taxi service on Lake Waikaremoana. This is because the local water taxi provider ‘Big Bush’ recently ended its water taxi services. If you are needing a shuttle for land-based travel we urge you to contact our Te Kura Whenua team as they may be able to offer a complimentary service. We hope this helps with your travel arrangements and you are able to come and enjoy Te Urewera and Waikaremoana. Cost: One Way - Child $25; Adult (13+) $50; Family (2 adults & up to 3 children) $120. As word continues to spread about the legal personhood of Te Urewera, so too does the return of Tūhoe to their traditional homelands after many, many years. This includes a revitalized Tūhoe presence at Lake Waikaremoana, where kaitiaki (guardians) are working as skippers on the water taxis, and are also stationed at the huts dotted around the lake to welcome manuhiri. Meet the team, and gain a little insight into what they do by clicking here. For safety reasons Ohora Swing Bridge near Ruatoki has been closed due to structural concerns, and will remain closed until further notice. Crossing the stream at Ohora is possible in low flows, but please stay within the limits of your abilities. Plan for your safety and ensure that you are prepared for all conditions. 20/12/2018 - THE TEMPORARY CLOSURE OF THE SECTION OF THE GREAT WALK BETWEEN WAIOPAOA HUT AND WAIHARURU HUT REMAINS IN PLACE. It is unsafe to use this part of the track until all repairs are completed. A timber structure bridge has been compromised and a culvert on this part of the track has been washed away. This means; Korokoro campsite, Marauiti Hut and Maraunui campsite are not accessible by land – only by water during this temporary closure. To limit disruption the Te Kura Whenua team led by Tina and Here have actioned a temporary water ferry service that includes a ferry from Waiopaoa Hut-Waiharuru Hut and visa-versa to bypass the closed part of the track, this will operate until the closed part of the track is reopened. Scheduled water taxi service runs also operate between Te Karetu and the Great Walk start/end points at Onepoto and Hopuruahine. A land based shuttle is also available from both ends of the great walk. The section of the Great Walk track from Waiopaoa to Waiharuru remains closed while work continues to address critical damage to track and structures. Our team has been in to clear away fallen trees and we are working through repair options to two remaining structures in order to bring this section of track back to an acceptable level of safety. We are very aware that many have bookings over the school holidays and we are therefore working hard to get the repairs completed as quickly as we can, and be in a position to signal an estimated re-opening date soon. We will keep you updated on progress as it becomes available, and appreciate your understanding while we work through this. As previously communicated, whilst the Waiopaoa to Waiharuru section is temporarily closed, water taxi options are available and the majority of the Great Walk remains open. We invite you to also consider one or more of the many short walk tracks that are open around Waikaremoana - they offer alternative options for manuhiri to experience the beautiful scenery and learn about the local history. These shorter walks allow you to take in the beauty of waterfalls, small lakes, cave systems, lookouts and Lake Waikareiti. They can be as short as the 20 min Hinau Track to the 8hr return trip to Sandy Bay Hut on the shores of Lake Waikareiti. More good news: While, for safety reasons, the Waiopaoa Hut to Waiharuru Hut section of the Great Walk track remains temporarily closed, the section from Onepoto through to Waiopaoa Hut has been cleared by our team and is now open. As a result, the majority (but not all) of the Great Walk track is now accessible for manuhiri to enjoy. · From Onepoto up to Panekire Hut and through to Waiopaoa Hut. All accommodation on the Great Walk Track is open, however, Marauiti Hut, Maraunui Campsite and Korokoro Campsite will only be accessible by boat as these are located within the closed section. As a reminder, as well as the Great Walk track there are many beautiful short and medium walk tracks around Waikaremoana that offer alternative options for your enjoyment. We now have manuhiri considering or starting to explore what these alternative tracks have to offer. Waikaremoana recently experienced severe weather conditions with strong winds and heavy rainfall over a short period. We have carried out a safety assessment and found a small number of critical structural issues in one section - including windfall and damage to a bridge and culvert, which will require some time to rectify. The good news: While, for safety reasons, we are keeping the Waiopaoa to Waiharuru section temporarily closed, there are still parts of the Great Walk that are available for manuhiri to enjoy. Open now: Hopuruahine through to Waiharuru Hut. Open from 6am, 21/09/18: Onepoto to Panekire Hut and through to Waiopaoa Hut. You will have the opportunity to book and stay at Panekire and Waiopaoa huts with the option of walking back or catching a water taxi, this will be the same with Hopuruahine through to Waiharuru where you will be able to book and stay at the Waiharuru and Whanganui Huts. All accommodation on the Great Walk will be open, however Marauiti Hut and Korokoro Campsite will only be accessible by boat. Please also consider one or more of the many short walk tracks that are all open around Waikaremoana - they offer alternative options for manuhiri to enjoy the beautiful scenery and learn about the local history. These shorter walks allow you to take in the beauty of waterfalls, small lakes, cave systems, lookouts and Lake Waikareiti, and can be as short as the 20min Hinau Track to an 8hr return trip to Sandy Bay Hut on the shores of Lake Waikareiti. See more information on the short walks below. • Note any safety conditions: take photos, identify the location and let us know. Note – all walking times start from car parks at start of tracks, unless indicated otherwise. SH38 between Murupara to Waikaremoana is now open - road is down to one lane through slip areas . Please take extra care whilst driving. The Papakōrito walking track at Āniwaniwa is now open. Waterways have been monitored with the waters running clear and levels lowering to a safe level. For those wishing to walk this track, we are advising that caution is recommended as parts of the track will still be wet and slippery. Due to the severe weather recently the Great Walk track was temporarily closed on Friday 6th September to ensure the safety of manuhiri. Our team are currently assessing the extent of damage to track and structures. Once this information has been collated, we will be in a better place to determine the neccessary steps for re-opening the track. The Great Walk track remain closed until further notice and we will do our best to keep you informed. For any further info please contact our team at Waikaremoana on the details below. The Second Bridge Sandy Bay (see map) is closed until further notice due to safety issues. Crossing the stream is possible in low flows, but please stay within the limits of your abilities. Please plan your interaction with Te Urewera thoroughly this will help to ensure that you are prepared for all weather conditions. Six foot track - one section is open with caution and four sections are open. Ø The section between Tawhana and Te Panaa is open with caution. There are two slips. One slip (nearest to Tawhana) has over 100m of the original track completely gone. Both slips will require people to exercise caution and to use off track skills and abilities to safely navigate around these new features. Ø All other sections of the track are open. Whakatane Valley Track - two sections are open with caution, two sections are open and some sections have not yet been inspected. Ø Sections between Waikirikiri and Waikare Junction Hut are open with caution. The Southern exit from Okohau stream/Whakatane river confluence has been compromised by a slip. Previous access on this section by horse is now no longer a safe option. Please consider this when planning your trip, especially if the river is in flood. Ø Waikare Junction Bridge is closed until further notice due to flood damage. Access is possible by crossing the Waikare River but only if the flows allow, plan your trip accordingly and stay within the limits of your abilities. Ø All other sections are open but some sections have not yet been inspected. All weather access to Onepu Track - open with caution. Ø This track is open with caution. The track is navigable with a diversion around a significant slip on the track. Ø Lances Hut has been removed due to erosion and offers no shelter or any facility to users at all. Please plan your trip with this in mind and take a temporary means of shelter with you. Ø Midway Hut has been burnt to the ground and offers no shelter or any facility to users at all. Please plan your trip with this in mind and take a temporary means of shelter with you. 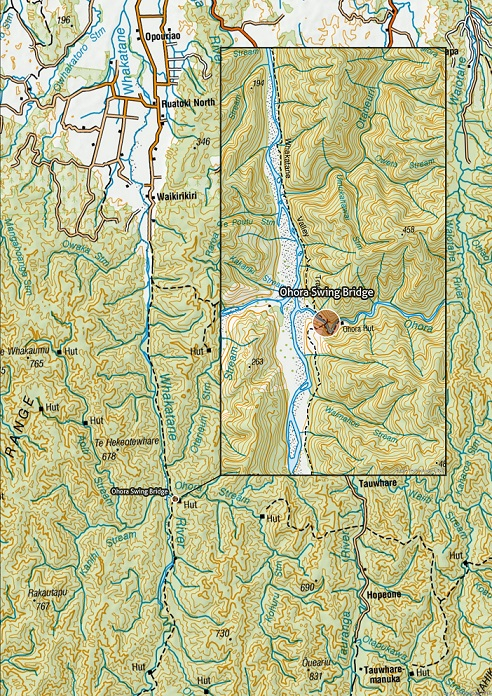 Refer to the Map of Te Urewera to for specific track and hut locations. We are tracking closely the developments of Myrtle Rust. It has arrived to our shores and cases have been found In the North of Te Ika ā Māui, the Taranaki area and also Te Puke. The public is being asked to keep an eye out for the signs of Myrtle Rust and report any sightings to MPI. Myrtle Rust is a plant-based disease that can be detrimental to the wellbeing of plants that belong to the Myrtaceae family. It has been found on Raoul Island 1100km north of Cape Reinga, on the east coast of Australia and has now made its way to New Zealand, recently discovered in a Northland nursery on the 02/05/2017. There are currently 46 confirmed myrtle rust finds: 39 in Taranaki, 4 in Northland, 2 in Waikato and 1 new find in Bay of Plenty. The affected sites vary greatly e.g. private land, nurseries, public land, orchards. Myrtle Rust is a fungus which attacks only plants from the Myrtaceae family. This includes New Zealand native plants such as Pohutukawa, Rata, Manuka, Kanuka, Ramarama, Rohutu and Swamp maire. It also attacks introduced plants including feijoa, eucalypts and bottle-brush. It is important that we learn how to identify the fungus to determine if it has arrived to Te Urewera. It attacks the leaves and can suppress flowering and seed development on many of the host plants. Repeated infections can kill, although it is yet to be seen how it affects plants in New Zealand – it appears to affect some plants differently depending on the country it is found in. TUT considers the situation extremely serious and is monitoring the spread and risk of the disease. Being a fungus it is controllable in a small infection by application of a fungicide spray, but it is not possible to control a large outbreak by that manner. This means unfortunately, that an outbreak in Te Urewera may not be able to be eliminated or controlled.